While industry will be looking for tax sops, economists would keep an eye on fiscal math. Investors, meanwhile, will watch out how effectively Jaitley trade between pro-poor and pro-market choices. As the Budget 2016-17 draws near, investors have started building expectations on a slew of likely reforms and announcements from the mega event, which could prove pro-investment and revive earnings of India Inc - a pre-requisite for the market to come out of the bear hug. There are widespread concerns over US Fed rate hikes, yuan devaluation and lack of steps taken by Bank of Japan (BoJ) and European Central Bank (ECB)to revive the regions. While India is seen to be in a sweet spot, given the falling commodity prices, earnings revival is yet to kick off in this part of the world. As such all eyes have shifted to the Finance Minister Arun Jaitley, who on Sunday promised to come up with banking reforms, other than key announcements in his third Budget, to give a fillip to the economy. Vikas Gupta, Executive Vice President and Chief Investment Officer at ArthVeda Capital believes even if budget turns out to be a pro-poor budget, the quality of government measures will determine market reaction. "What will matter is whether the pro-poor push is led by redistributive expenditure like subsidies and MNREGA schemes or led by productivity, efficiency and infrastructure-led push. In the case of former, it would be clearly taken as negative by the market," told Gupta to Business Today online. 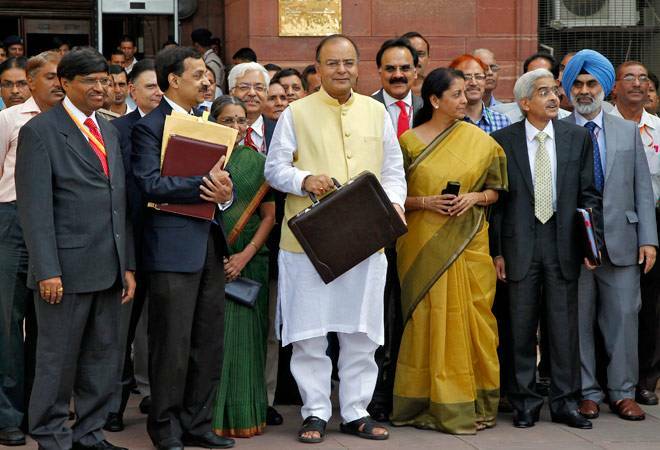 The government had revised its fiscal deficit target from 3.6 per cent to 3.9 per cent in the previous Budget. Analysts feel a deviation again in this Budget will mean loss of credibility. "While a small slippage may not be viewed negatively, any adverse comment to rein in the deficit will have an impact both on bond and equity market investments by foreign institutional investors (FIIs)," told Shrey Jain, Founder and MD, SAS online.com to Business Today online. Tax announcements are the most striking feature of Budget and are closely followed by industrialists and common men alike. Investors are expecting more tax incentives for savings in the pension funds under National Pension System (NPS). "A level playing platform on tax incentives for all kinds of long term savings products, be it Mutual Fund or Life Insurance Sector or National Pension System is expected," told Shridhar, CIO, IndiaFirst Life Insurance to Business Today online. Dinesh Rohira, Founder & CEO, 5nance.com said: "Tax reforms have always been an important lever in defining the success of any budget, it's been long due, there is a golden opportunity in this budget to get constructive in this area and bring about a meaningful change." On Goods and Services Tax (GST), Rohira sounded caution and said GST may take some time because of the political deadlock, however, simpler and effective tax reforms if carried out in this budget, especially towards enabling the common man and stimulating retail participation in the growth story, will go a long way in creating a very positive environment vide this budget. The government has neglected growth and stimulation in the infrastructure and real estate sector over the last three-four years. As they hold significance on contributing to an overall growth of the economy, a strong boost to these sectors must be accorded in this budget. "We expect the budget to provide a clear roadmap for an increase in capital expenditures by government especially in the infrastructure sector. This, in our view, is extremely critical especially in light of the declining investment by private sector. Sectors like roads, railways, ports should be a clear focus area," said Gupta. For Ambareesh Baliga, independent market analyst, focus on rural segment, thereby reviving the rural economy is one of the most important expectations from the coming Budget. In the same vein, Gupta expects the Budget to introduce measures to stimulate the agrarian economy given the deficient monsoon led slowdown over the past few years crippled it. However, stimulus measures, he added, should be more oriented towards improving productivity and efficiency of system by building rural roads and improving irrigation systems etc, rather than making redistributive expenditures like subsidies. Dalal Street expects a lot more clarity on the plans to improve the state of public sector banks (PSBs) either through big bang capital infusion or privatisation. "Between 4,00,000-5,00,000 crores capitalization is required for the PSBs. This will restore their capital adequacy ratio to a respectable level and position them for fresh lending opportunities," said market analyst Sudip Bandyopadhyay. Fiscal prudence on the part of government will be closely monitored. Jain advises the government to avoid going further down the path of fiscal adventurism in this Budget. "Lower than expected revenue growth, the Seventh Pay Commission award, OROP award to defence personnel, and the failure to meet the disinvestment target will make it difficult for the government to meet last Budget's fiscal deficit target," said Jain. Jain also hopes the government will announce reforms aimed at enhancing ease of doing business in India. FDI has turned buoyant in recent times even as FII flows into equities have turned negative, said Jain, adding more sops should be given to foreign investors to encourage further FDI flows. "The tax regime in particular should turn investor friendly and issues like retrospective tax should be given a burial. Foreign investors will find an announcement to this effect reassuring," suggested Jain. Baliga expects home loan rates to come down, while Gupta calls for special focus on housing for all program, low income housing and smart cities.